Paper cups have a history! Once upon a time there were no paper cups, then one day there they were. In a tangential way, my family history intersects with that of the early paper cup. It was invented by Lawrence Luellen in 1907 and first manufactured in Pennsylvania, my home state. The first commercial use of paper cups was on the Lackawanna and Western Railway as a hygienic alternative to the metal dippers then attached to communal water barrels in each railway car. My great-grandfather, Alfred McCallum worked for the Lackawanna Railway at that very time, and since he was an inveterate tinkerer, inventor and man of progress, I can imagine how much he would have enjoyed their appearance. 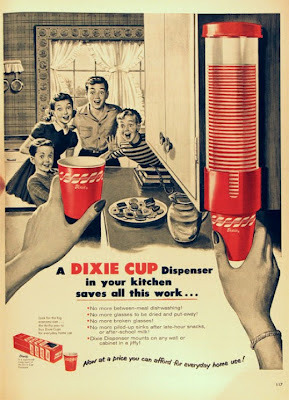 Dixie company was in on the paper cup thing early on. 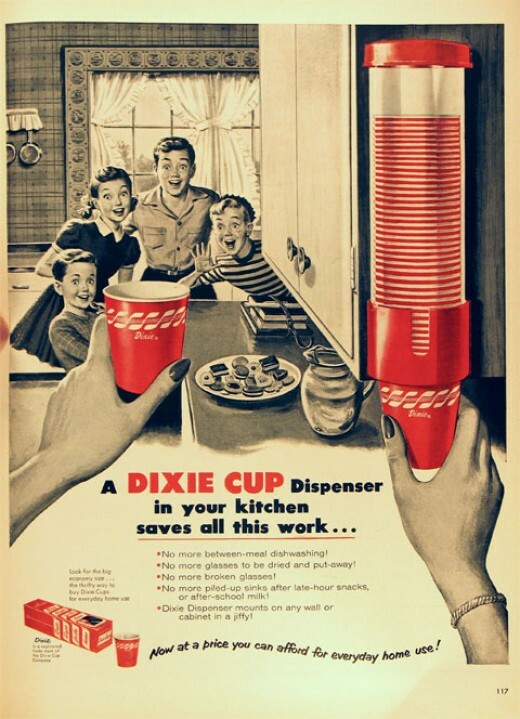 In fact, like Hoover and Kleenex and Xerox, Dixie has long been synonymous with paper cups. 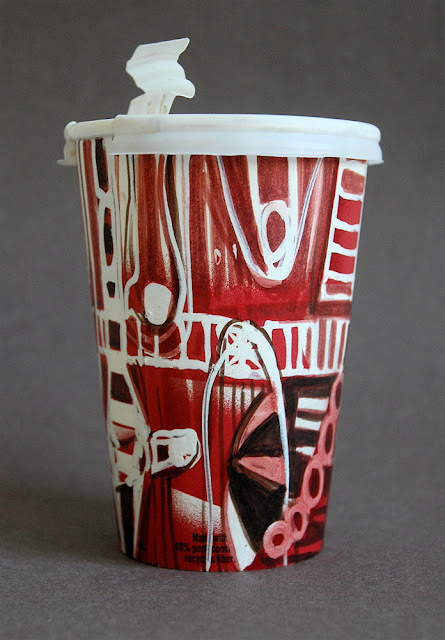 How fitting then to see that the Museum of Modern Art here in New York City has finally acknowledged the remarkable Dixie paper cup in its current show of everyday objects, Born Out of Necessity, reviewed recently by Roberta Smith. We had one of those dispenser things in our kitchen growing up. Didn't everybody? MoMA's design department does this kind of thing very well. I thoroughly enjoyed last year's Counter Space: Design and the Modern Kitchen. The history of kitchen design in the 20th century was beautifully documented with objects, photos and artwork: from early century, awkwardly laid-out rooms which were the site of time consuming activity, to the pared-down and high-tech at the turn of the Millennium. My eye was drawn of course to the tea and coffee pots. I was not at all surprised that the Bialetti 1930 espresso pot was included in that show or that it resides in their permanent collection. It is such a beautiful thing - heavy, faceted, sculptural. Many artists love it. They draw and paint it, they animate it. Some even use it to make coffee! 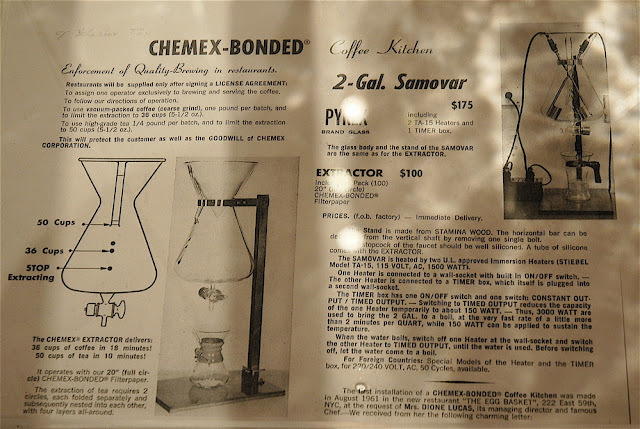 I was not surprised that a two gallon Chemex coffee carafe was there too. It is a weird beast, a Rude Goldberg coffeemaker that I had never seen in real life. But there it was and a diagram of the heating elements and their correct placement revealed it as the science experiment it appears to be. But I was amazed to see my grandma's 1946 aluminum percolator! It has a designer? Her percolator still sat on the top shelf of a cupboard when my parents finally decided to move out of their big Philadelphia house in 2004, and we threw it away. I can't say I have ever missed the battered thing, but it was nice to see it again at MoMA. And there it is again on the wall of my studio, in a little sketch my mother did of her mother c. 1950, when that coffee pot was the latest thing. I never even noticed it in that painting before! How very Bonnard. Counter Space: Design and the Modern Kitchen is over, but Born Out of Necessity is on view at MoMa through January 2013. Go and see that Dixie cup! 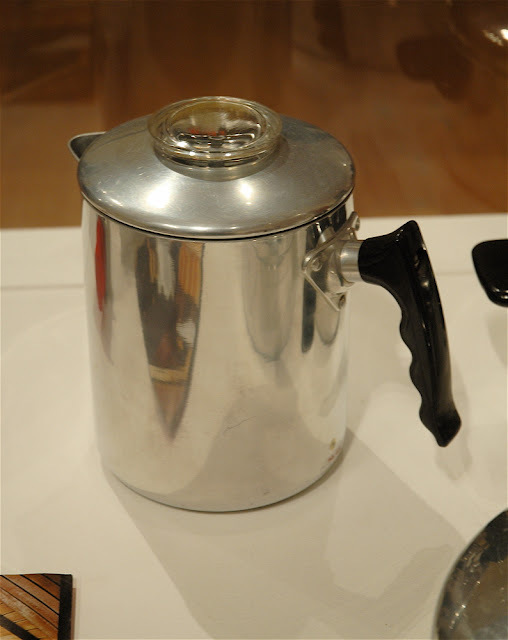 Certain classic tea and coffee pots are also part of the permanent design collection. And make sure to look closely in the painting and sculpture galleries on the fourth floor. A nod to tea and coffee time will reward you here and there! If you spot the images I am thinking of, let me know. 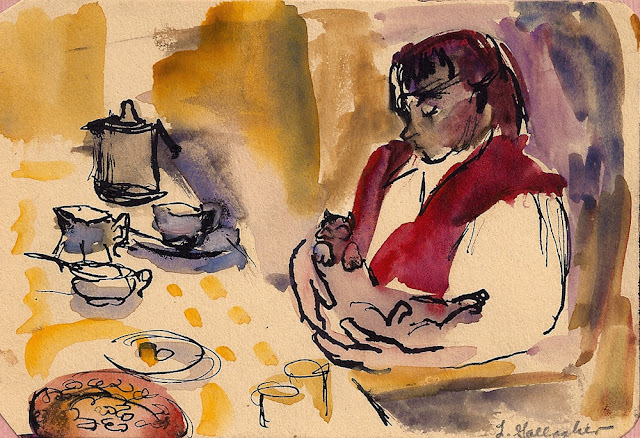 and your mom's art - i can almost hear the cat purring! 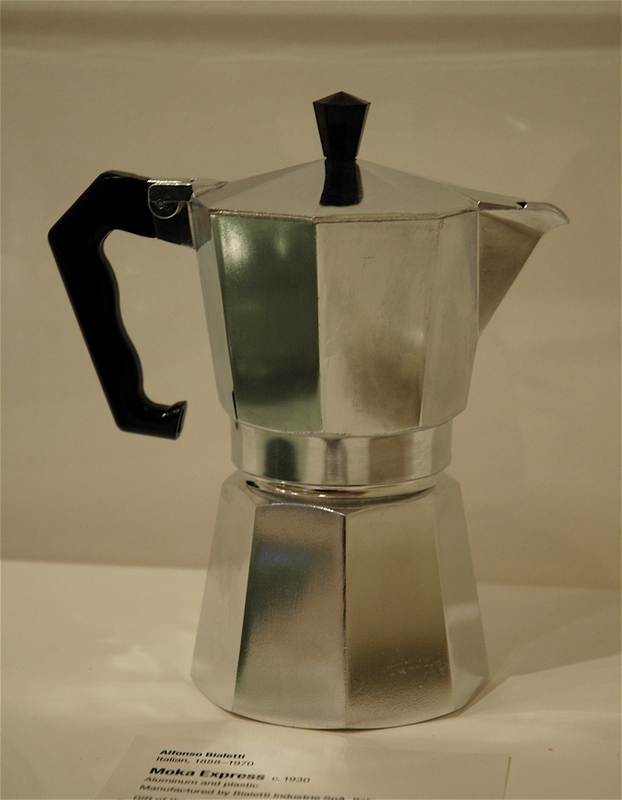 Surely MoMA had on display the sensual globes of the Sunbeam Drip-O-Lator that graced our kitchen counter top in the 50's...I loved the shape of that coffee pot. It was a beast to clean, but the coffee was divine. Wish I lived in NYC so I could attend the show. I was just reading about the master artists of the Impressionist era, who said, that we should paint the beauty of the ordinary, the simple things of every day life. Thanks for the history lesson of the paper cup...interesting, indeed. Who would think the lowly coffee cup could be so entrancing. It only proves the right artist can find beauty in the most mundane objects. Creating art even from waste objects is kind of fascinating. I recently went to some exhibition and they have made an Eiffel tower made of paper cups. It was quite wonderful. Nice work by the way.